I’ve rounded up 15 website performance testing tools to help you make your web site blazing fast. At the time of testing, all of these tools were free and did not require any web site testing software to be installed. You simply supply your URL and your website performance test is underway. Some tools, like Webpagetest and LoadImpact, are very robust, while others like Redbot and Alertra just provide simple checks. I use many of these tools every week when optimizing servers to give the best website performance. WebPageTest is my favorite website performance tool for quickly testing what is wrong with a slow loading site. The tool includes waterfall charts, compression and caching testing. Best of all you can run both initial and repeat views as well as run multiple tests to average out results. Waterfall charts break down each individual component so you can spot what’s slowing down your site. 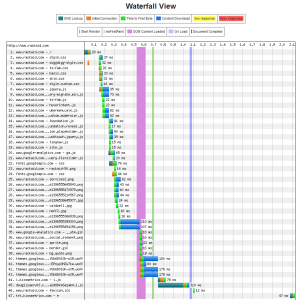 Waterfall views help you pinpoint what components may be causing your site to slow down. Webpagetest also marks the start render and page complete times which are critical factors in website performance. This is another excellent tool similar to the one above. Many people like it because you get your Google PageSpeed Grade and your Yslow Grades. This can make it easy to show improvements to clients. I recommend this tool if you are mainly looking to improve front-end performance. WordPress sites often receive low scores on some tests. This is mostly due to themes and plugins adding custom CSS and JS files which can cause a low score. Pingdom provides excellent monitoring services but they also include a free full page performance testing tool. 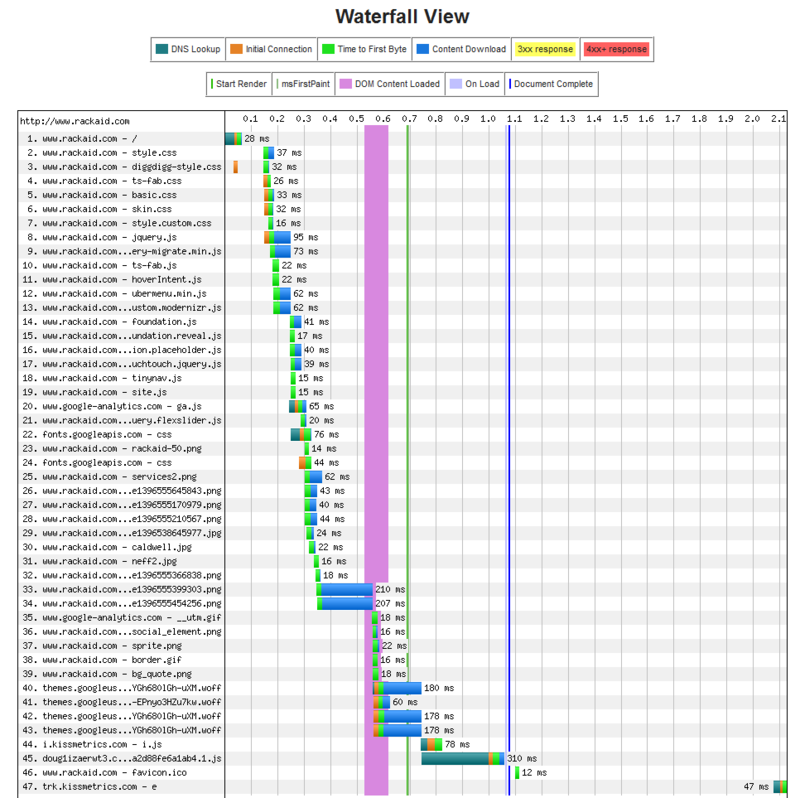 The main report is a waterfall view your sites load times. They also include some scoring. This performance tool runs very quickly, so you don’t wait long for the results. Also, I find the report layout easy to use. They make it very easy to grab response headers on a per HTTP request basis. This can be beneficial if you are fine tuning HTTP response headers to improve performance. Don’t worry about scores. Pay attention to the details. Here our site scored 69 but load time was just 0.5s and is faster than 97% of all tested sites. This tool has been around for ages, but is very useful if you need to test from multiple locations. There’s probably more than 100 locations available to choose from. Relatively new with tons of features. They like to break tests down into small parts. The results are very similar to Google’s page speed but the layout and ease of use is great. They link each poor test result to an explanation about why it is important. This is great when you have to explain an issue to someone not familiar with web site performance optimization. Feedthebot has many interesting tools. Best of all each issues is liked to a simple description of the problem. 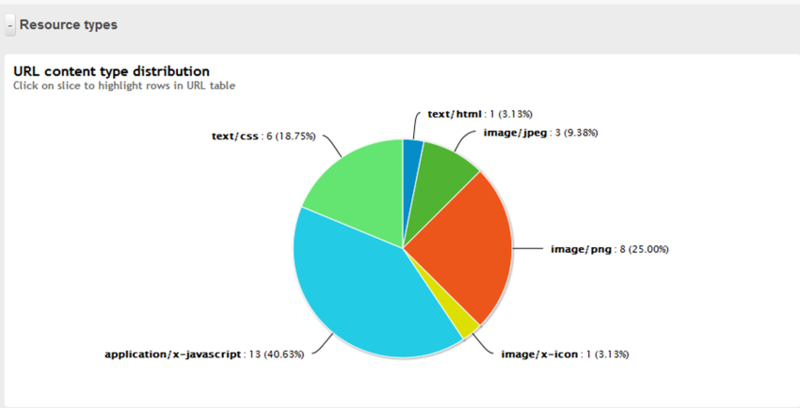 Will be a great resource in helping explain web performance optimization issues to customers. They provide both mobile and desktop testing. Interestingly, they default to the mobile view. More and more people consume content on mobile devices, so make sure your site is mobile ready. Test your site’s performance from 20 locations with just one click. I like this tool because it does full browser testing – not just a HTTP get request like some other tools. They include waterfall charts from all 20 locations! This is great if you have customer complaining about slow site speeds but you cannot replicate the issue. Sometimes network issues can wreck a site’s performance but make it difficult for you to detect without monitoring from multiple locations. Alertra’s SpotCheck tool is great to get a quick up or down response from multiple locations. I often use this to quickly test sites when clients report issues. Generally if Alertra’s test show no issues the problem is highly isolated to a specific region or something specific to the customer’s actions. This is a fun little tool to simply see which site loads faster. Put two URLs into their form and press go. May be useful in doing quick tests between sites or showing a client how much faster a site could be with different hosting. Load Impact provides load testing and monitoring. You can get a free basic test or sign up for more in-depth testing. They will test from multiple locations and then deliver a report about your site’s performance. The metrics are very details and from multiple locations. This is probably one of the better free, mulitple-location web performance testing tools. This is a great little tool to check HTTP headers. You would be surprised at how many websites have poorly formed headers. Bad headers can ruin caching, CDN effectiveness and even cause the wrong pages to show to mobile browsers. I use this tool to easily show customers what headers are being sent by their site. If the headers are being set by the application, they can then forward this to their developers to get the issue resolved. This basically provides a quick check of your sites download time from 30+ locations. Will not allow you to dig into deeper web performance issues but can certainly help spot network issues that are impacting page load times. Sometime simplicity is key. OctaGate SiteTimer is a very quick waterfall chart generator. Could be useful if you are having to test and re-test. Fast waterfall reports are what make this tool useful. Not too much detail but runs very quickly and its free! A collection of tools for hosting speed checks, DNS checks and more. They keep moving things around and adding/removing features. While not a website performance testing tool, if your DNS is broken, your site may be too. Be sure to check any subdomains used for CDNs or other content on your site. This is not a general performance tool but a tool we use. You can manage multiple WP sites from a single location. This is vital if security and performance are important to you. So instead of logging into dozens of WP dashboards, you have all of your info in one place.